The team behind plant-based restaurant Café Gratitude will open a second location of Gratitude in Beverly Hills. (The original made its debut in Newport Beach earlier in 2016.) It will feature a menu of seasonally driven, environmentally friendly vegan cuisine, as well as handcrafted cocktails. Gratitude, 419 N. Canon Dr., Beverly Hills, CA 90210, no phone. Century Boulevard now hosts a second location of Dulan’s Soul Food Kitchen. Look for smothered pork chops, Southern-style short ribs, oxtails and signature fried chicken, alongside sides like black-eyed peas, corn and okra, and collard greens. For dessert, there’s sweet potato pie and peach cobbler. Dulan’s Soul Food Kitchen, 1714 W. Century Blvd., Los Angeles, CA 90047, 323-418-8527. On Beverly Boulevard, chef Gino Angelini has added Angelini Alimentari next door to his popular Italian spot Angelini Osteria. Open for breakfast, lunch and takeaway, this casual café sports an espresso bar and outdoor courtyard patio in back. Expect pastries and morning items like a breakfast panino and two-egg zucchini frittata; alongside soups and salads, Angelini specials include white fish Milanese, Gino’s meatballs, braised tripe and hanger steak. There’s homemade gelato daily, in a cup or cone, affogato or a warm brioche gelato sandwich. Angelini’s pasta sauce is available for takeout. Breakfast & Lunch daily. Angelini Alimentari, 7317 Beverly Blvd., Los Angeles, CA 90036, 323-297-0070. Baja California’s renowned chef Diego Hernandez (Corazon de Tierra) will open a contemporary Mexican restaurant, Verlaine, in West Hollywood in the former Dominick’s space on Beverly Boulevard. Look for a winter opening. Verlaine, 8715 Beverly Blvd., West Hollywood, CA 90048, no phone. Look for a third location of actor Danny Trejo’s hipster taco joint, Trejo’s Tacos, to open Silver Lake-adjacent on Virgil Avenue in late fall 2016 or early winter. Trejo's Tacos, 611 N. Virgil Ave., Los Angeles, CA 90004, no phone. Fabrizio and Diana Bianconi (Via Veneto) have opened Bianconi in the former Ortolan space. 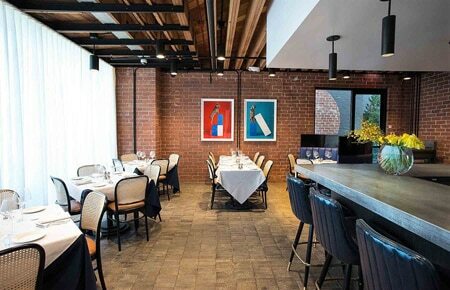 Kris Keith’s Spacecraft Design Group revamped the restaurant with an Italian-European vintage-industrial look. The menu emphasizes traditional Italian cuisine with Mediterranean influences and focus on wood-fired cooking. Bianconi, 8338 W. Third St., West Hollywood, CA 90048, 323-879-9777. Restaurateurs/chefs Brooke Williamson and Nick Roberts (Playa Provisions, Hudson House, The Tripel) have opened their fourth restaurant, Da Kikokiko, a casual, neighborhood-friendly Hawaiian concept. 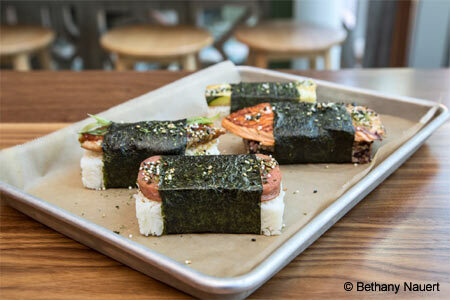 The eatery celebrates the island’s biggest street foods --- poké, shave ice and Spam musubi. Da Kikokiko, 12746 Jefferson Blvd., Playa Vista, CA 90094, 424-835-4192. In Echo Park the hipstery honey hi is now serving breakfast and lunch, offering dishes like a Moroccan bowl with lamb harissa meatballs, zucchini noodles and carrot fennel slaw; a sweet potato and avocado sourdough tartine; bone broth; and a cashew yoghurt parfait. To drink, find coffee, smoothies and matcha lemonade. Frittatas, sandwiches and salads are coming to the menu soon. honey hi, 1620 Sunset Blvd., Los Angeles, CA 90026, 213-221-7810. Sandbox has opened in the former Bugatta Supperclub, with a nostalgic focus on vintage video, pinball and skiball games. Look for a slicked-up bar menu featuring short rib tacos with kimchi and hoisin glaze, smoked brisket quesadilla, specialty burgers, gourmet pizzas and a weekend brunch with bottomless bubbly. To drink, find specialty cocktails and martinis, along with draft beer and wine. There are three bars, and a patio out back. Sandbox, 7174 Melrose Ave., Los Angeles, CA 90046, 323-964-9494. Salt & Straw, the iconic Portland-based ice cream purveyor, has opened its fourth Los Angeles scoop shop in Downtown LA’s Arts District. Look for popular flavors in cones, milkshakes and sundaes, including sea salt with caramel ribbons, Stumptown coffee & Compartes love nuts, avocado & strawberry sherbet, and black olive brittle & goat cheese. The new shop will also begin hosting a series of community events and pop-ups, including a Producer Series that spotlights area artisans with whom Salt & Straw collaborates on seasonal flavors. Salt & Straw, 829 E. Third St., Los Angeles, CA 90013, 213-988-7070. Plan Check Kitchen + Bar opens its fourth location in Los Angeles, heading west to Ocean Avenue along the coastline of Santa Monica. The launch of the brand’s newest outpost adds brand-new dishes and drinks inspired by the beach. Executive chef Sean Yontz presents a selection of seafood-focused appetizers and entrées to complement the restaurant’s signature lineup of burgers and loaded fries. The new plates include modern twists on traditional seaside dishes of New England and the Southern Gulf, such as lobster rolls and hot fish sandwiches. 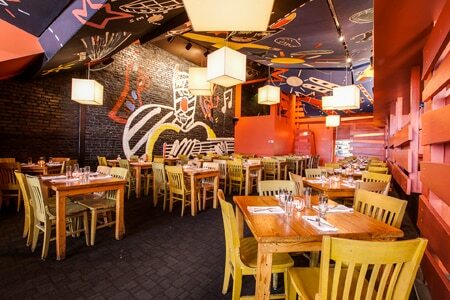 Plan Check Kitchen + Bar, 1401 Ocean Ave., Santa Monica, CA 90401, 310-444-1411 . Hollywood is all about sequels, so it's only fitting that Cleo should get one, too. Disruptive Restaurant Group, a subsidiary of sbe, has opened a branch of the Mediterranean restaurant at L.A. LIVE. Chef Daniel Elmaleh has created exclusive new dishes for the menu. Cleo, L.A. LIVE, 800 W. Olympic Blvd., Los Angeles, CA 90015, 424-888-7818. Highland Park’s cozy new coffee/brunch spot is Jane, located in a vintage bungalow on York Boulevard. Look for fluffy omelets, chorizo huevos rancheros, kimchi fried rice and banana pancakes for breakfast/brunch; salads and sandwiches round out lunch. Four Barrel coffee offers a good caffeine fix, and there are front and back patios. Breakfast, Brunch & Lunch Tues.-Sun. Jane, 5830 York Blvd., Los Angeles, CA 90042, no phone. Kukui Hut Cafe has opened in East Hollywood, offering large portions of Hawaiian cuisine — traditional kalua pork and loco moco, as well as bbq plates and burgers, and for breakfast taro, pandan and ube pancakes. Fusions include kalua pork fries with fried eggs, and kalua pork mac and cheese. For dessert, explore shaved ice and tropical flans. Breakfast, Lunch & Dinner daily. Kukui Hut Cafe, 1308 N. Edgemont St., Los Angeles, CA 90027, 323-522-6725. The Toscana Restaurant Group (Toscana and Bar Toscana) will debut a new Italian restaurant, Nerano, in Beverly Hills in November 2016. Expect cuisine of the Amalfi coast from chef Michele Lisi (Vincenti), a bar program from William Perbellini (Bar Toscana) and a wine list specializing in Amalfi coast wines. 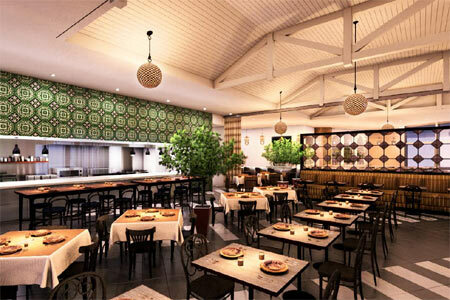 The spacious restaurant will offer two dining rooms and two bars. Nerano, 9960 S. Santa Monica Blvd., Beverly Hills, CA 90212, 310-405-0155. Restaurateur Adam Fleischman and chef Kiyoshiro Yamamoto (The Hump) will launch Ramen Roll in Culver City in the former Picnic LA space. Expect ramen, bowls, sushi and hand rolls. Look for the opening around Christmas or New Year’s 2016. Ramen Roll, 9900 Culver Blvd., Culver City, CA 90232, no phone. San Francisco import Mr Holmes Bakehouse has set up shop in Highland Park. The bakery’s specialty is “cruffins” --- chewy-crispy, muffin-shaped, cream-filled, sugar-dusted croissants. Mr Holmes Bakehouse, 111 S. Avenue 59, Los Angeles, CA 90042, no phone. Manuela has made its debut in the Hauser Wirth & Schimmel arts complex in downtown Los Angeles. (The restaurant is named after the company's partner and co-president: Manuela Wirth.) Expect "soulful" fare with Southern flair and seasonal ingredients. Manuela, 901 E. Third St., Los Angeles, CA 90013, 323-849-0480. Patina Restaurant Group has opened the brunch restaurant, Maple, at Descanso Gardens. Chef Mark Salazar’s brunch menu (served Saturday and Sunday from 9 a.m to 2 p.m.) includes a beef short rib breakfast burrito, a garden Benedict with baby kale and roasted squash, brioche French toast, fried chicken and beignets, and a maple burger with fries. Winter dinner hours and menu will be announced in the fall. Brunch Sat.-Sun. Maple, Descanso Gardens, 1418 Descanso Dr., La Cañada Flintridge, CA 91011, 818-949-4200. While Oh Man! Ramen waits to open its first brick-and-mortar location in Encino, it is serving lunch at next-door sister restaurant Scratch|Bar & Kitchen. Every Monday through Friday from 11:30 a.m. to 3 p.m., chefs Luke Reyes and Phillip Frankland Lee offer patrons several dishes that will be found at Oh Man! Ramen once the new restaurant permanently opens in the coming weeks. Additionally, each week, they will test out 3-5 new specials. Selections on the opening lunch menu will include salmon sashimi, grapes, daikon, peanuts, fish sauce vin and nori chip; and tonkotsu pork ramen, braised pork belly, confit shoulder, bamboo shoot, green onion, soft egg, shiitakes and bonito flakes. Oh Man! Ramen, Encino Place, 16101 Ventura Blvd., #242, Encino, CA 91436, no phone. Blvd., Los Angeles, CA 90026, 323-641-3709. Longtime favorite Chaya Venice has reopened with a light, mod and modern look and revamped menu after a two-week remodeling closure. Chef Yuichi Natori’s refreshed menu features old favorites, as well as uni risotto, rib-eye steak, a kaisen platter, duck sliders and twin butterflied quail. Chaya Venice, 110 Navy St., Venice, CA 90291, 310-396-1179. 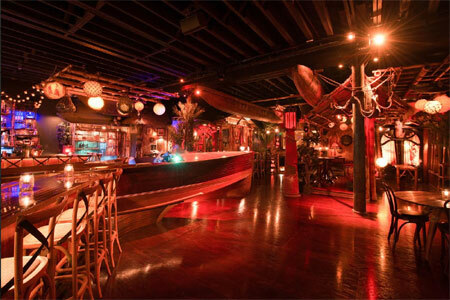 In downtown LA, the historic Clifton’s Cafeteria and nightlife venue will open a swank tiki bar, The Pacific Seas, in Fall 2016. It will be accessed via a secret staircase. Look for colorful murals, thatch work, vintage artifacts and live Polynesian performers. The bar’s vintage Chris Craft mahogany boat deck will serve classic tiki cocktails (think Mai Tais and Fog Cutters) and Polynesian cuisine from Clifton’s chef Andrew Pastore, including a bluefin tuna poke platter, lump crab cakes, lobster dynamite, and a crispy whole red snapper. The Pacific Seas will be open Tuesday and Wednesday from 5 p.m.-midnight, and Thursday through Saturday from 5 p.m.-2:30 a.m. The Pacific Seas, 648 S. Broadway, Los Angeles, CA 90014, 213-627-1673. 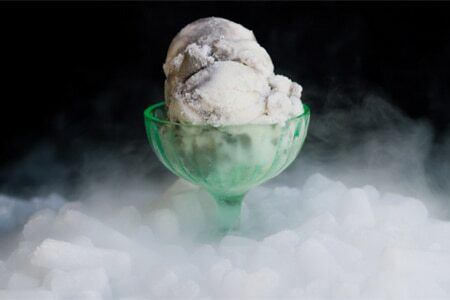 Ice cream shop Salt & Straw is serving up a special "Spooktacular Series" of flavors for the month of October. Dracula’s Blood Pudding is not for the squeamish! It’s made with real blood pudding with a hint of chicken liver. Sugar fiends will go gaga over the The Great Candycopia, composed of salted butterscotch ice cream loaded with homemade Snickers, Whoppers, Heath Bars and peanut butter cups. Jack o’ Lantern Pumpkin Sherbet ignores pumpkin spice mania and simply sticks with the squash’s natural flavor. The red-tinted Love Potion Sorbet tickles the tongue with a blend of aphrodisiac fruits and spices, while Essence of Ghost is a slightly musky sherbet tinged with wisps of gray. These flavors are available by the scoop, flight or pint. (The variety pack is also available for nationwide shipping.) Salt & Straw, 240 N. Larchmont Blvd., Los Angeles, CA 90004, 323-466-0485. New Zealander Jean-Paul Lourdes (Pierre Gagnaire, Paris) will now take charge as the executive chef of The Restaurant at The Getty Center. His newly debuted, frequently changing menus will highlight seasonal offerings from the Hollywood and Santa Monica farmers markets, and locally and sustainably caught fish and shellfish. The Restaurant at The Getty Center, The Getty Center, 1200 Getty Center Dr., Los Angeles, CA 90049, 310-440-6810. Chef Raphael Lunetta (former chef-owner of the shuttered French restaurant JiRaffe) is back on the Santa Monica dining scene at The Georgian hotel. He will introduce new menus of "Coastal California" fare at The Veranda restaurant. The Veranda, The Georgian Hotel, 1415 Ocean Ave., Santa Monica, CA 90401, 800-538-8147. Restaurateur Stéphane Bombet and executive chef Michael Hung have parted ways with Viviane restaurant. Viviane, Avalon Hotel Beverly Hills, 9400 W. Olympic Blvd., Beverly Hills, CA 90212, 310-407-7791. O'Brien's Irish Pub & Restaurant in Santa Monica is temporarily closed. O'Brien's Irish Pub & Restaurant, 2941 Main St., Santa Monica, CA 90405, 310-396-4725. At Echo Park Lake, Square One at the Boathouse is closed and will be replaced with Curate Café, which will offer a similar menu of casual café fare. Square One at the Boathouse, 751 Echo Park Ave., Los Angeles, CA 90026, no phone. Popular neighborhood spot Magnolia has closed after more than a decade on Hollywood Boulevard. Magnolia, 6266 1/2 W. Sunset Blvd., Hollywood, CA 90028, no phone. Woodland Hills has lost its 40-year-old location of Jerry’s Famous Deli, which closed October 16. The restaurant’s Encino and Studio City branches remain open. Jerry's Famous Deli, 21857 Ventura Blvd., Woodland Hills, CA 91364, no phone. Typhoon, one of Santa Monica’s most charming and iconic spots, will be closing on November 8, 2016, due to rent increases and the possible future closure of the Santa Monica Airport. Typhoon, 3221 Donald Douglas Loop S., Santa Monica, CA 90405, 310-390-6565. On Pico, Steingarten, the gastropub popular for its lengthy menu of sausages and fine beers, has closed. Steingarten, 10543 W. Pico Blvd., Los Angeles, CA 90064, no phone. Chefs Mary Sue Milliken and Susan Feniger, formerly Food Network's “Too Hot Tamales,” closed the original Santa Monica location of their Border Grill restaurant after more than two decades of business. The duo plan to open a new concept in Santa Monica. Border Grill Downtown LA remains open. Border Grill, 1445 Fourth St., Santa Monica, CA 90401, no phone. Moruno at The Original Farmers Market has closed. Sister establishment Bar Moruno at Grand Central Market remains open. Moruno, The Original Farmers Market, 6333 W. Third St., 110, Los Angeles, CA 90036, no phone. Caribbean restaurant Cha Cha Cha in Silver Lake has shuttered. Cha Cha Cha, 656 N. Virgil Ave., Los Angeles, CA 90004, no phone.